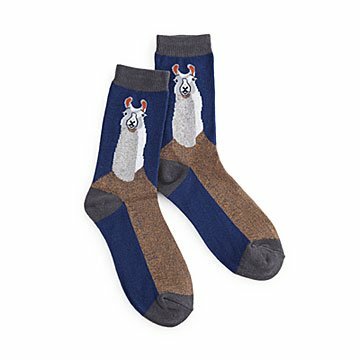 Add a little llama drama to your look with these color-blocked socks. Here's llooking at you, llama. These color-blocked, cotton-blend socks showcase everyone's favorite humpless camel, the llama, in a unique twisted yarn design. Made in Taiwan. I bought several pairs of these socks for family members and myself at Christmas this year. Great big and detailed llama pattern. Great gift! Whimsical and soft socks. Who doesn't love llamas? She wears them on her feet, as one does with socks. They are llama socks. Nothing special, unless you love llamas! This was a snap-decision impulse purchase that I knew was perfect! Great price and quality. These are cute and comfy socks that are a hit for the person who got them! Our friend couldn't stop raving about the socks. She loved their design and their feel. She cannot wait to wear them! These are darling and eye catching, especially if you love â�¤ï¸� Llamas!! !